The relatively cool air in Arizona during the winter creates ideal conditions for people to get outside and enjoy themselves. With the oppressive heat gone, it is time to step out into the great outdoors and get some fresh air. Complete Care Medicine is the kind of place you can go to speak to a Gilbert family doctor about your health, and to discuss any obstacles that may stop you from enjoying the great outdoors. You should never start an exercise regimen without getting a comprehensive check from a provider at Complete Care Medicine. Your doctor can let you know what to watch for when you get outdoors, and how to monitor your health. With all of the beautiful landscape in Arizona and the interesting places to visit, you should consider hiking as a way to get some exercise and see the sights. It would be the time to enjoy the health benefits of hiking and take advantage of all that Arizona has to offer. Always dress appropriately for your hike, and bring extra clothing in case it gets cold. If you have room in your pack, then bringing some small form of shelter and a sleeping bag along can save your life if you find yourself stranded in the cold Arizona desert. Always have your GPS with you, a solar charger for your phone, sunscreen, some small food packages and water. If you are new to hiking, then avoid steep inclines until you have had some chance to get your body used to the exhilaration. Always be mindful of potentially dangerous creatures, especially the ones that hide in the Arizona brush. Have a cell phone handy at all times, and be sure to tell someone where you are going and when you expect to be back so they can report you missing if something goes wrong. Many people think that hiking’s main benefit is in helping your cardiovascular system to become active and getting more oxygen into your blood. But the combination of physical activity and cardiovascular exercises is what really makes hiking an ideal type of exercise. Your leg muscles are being conditioned at the same time that your heart is pumping more blood throughout your body. Hiking is a coordinated effort between your heart, lungs and leg muscles, and working all of those parts of your body together in one activity can be extremely beneficial to your circulatory system, your breathing and your muscle tone. It is extremely important to avoid hiking in brand new boots or athletic shoes. Brand new boots do not have the give you need to avoid blisters and painful ankles. You will find that your hike will be more beneficial to your body if you wear boots that are already broken in to fit you perfectly. Remember to listen to the weather forecasts before you head out on your hike. While the winter does not bring the torrential rains, it still rains in the desert in the winter. If the forecast calls for sprinkles, then you should be able to enjoy your hike with basic rain protection gear. But if there are some heavy showers in the forecast, then you may want to cancel your hike and try another day. To get the maximum health benefits from your hike, you will want to maintain a brisk pace for the journey out, and a brisk pace for the journey back. If you are taking several breaks on your hike, then you are going too far. The brisk pace is what keeps your blood pumping, your muscles working and it helps your lungs to take in and circulate that fresh Arizona air. For most new hikers, a four-mile hike is the ideal distance. Remember that the distance of your hike includes the trip back, so plan your hike accordingly. As you start to feel the positive effects of regular hiking, you can expand your hike distance in safe increments that will help you to see more of the great outdoors and reap more of those healthy benefits. Since hiking in Arizona in the winter is such an enjoyable form of exercise, people often want to get their families involved as well. But until you are an experienced hiker, you should not make yourself responsible for an entire hiking party. From animal attacks to losing your bearings, there is a lot that can happen on a hike that a leader needs to know how to handle. Your hike will not be a very healthy adventure for you if you don’t know what you are doing. If you bring your children along with you, remember that they do not have the same capacity for exercise that you do. Their step is shorter and they don’t have the endurance of an adult. If you bring children on your hike, be mindful of them and plan accordingly. 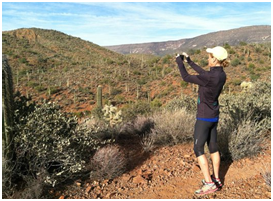 Arizona is an ideal place to hike in the winter to invigorate your body and feel healthier. Always check before you go hiking for the first time with a Complete Care Medicine Gilbert doctor during your yearly physical or well woman exam to make sure you don’t have any issues that could be enhanced by a brisk hike. Once you get cleared by your doctor, it is time to hit the trails and see everything Arizona has to offer. Click here to find some family friendly hikes in Arizona.